Match-3 games have kind of a lousy reputation in the gaming world, and this is for two simple reasons. 1) They’re wildly popular, which almost automatically means jaded game reviewers like myself are going to view them a little suspiciously, and 2) They’re relatively easy to make and play, which means that for every match-3 game with original graphics and an interesting gimmick, there are at least half a dozen more which are just bland carbon copies of the last big hit. Now, this doesn’t mean match-3 games aren’t fun or worthwhile, but it does mean the bar needs to be set that much higher if one is going to stand out in any way. If, however, you’re already dead set on putting out a relatively dull match-3 game, don’t do it in such a way as to explicitly invite comparison between your game and an obviously superior one. Take the example of The Crystals of Atlantis Deluxe and Call of Atlantis. They are two very similarly named match-3 games, but unfortunately for The Crystals of Atlantis, Call of Atlantis is a much, much better game, for exactly the same price. To be fair, The Crystals of Atlantis isn’t a terrible game; it’s just not a particularly interesting one. 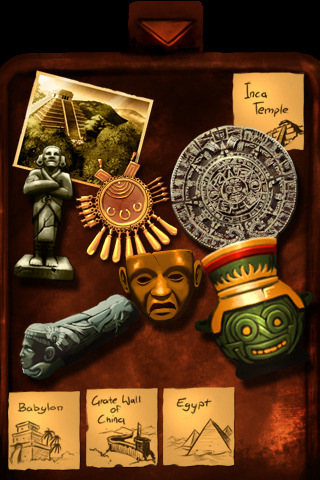 You are charged with going around the world recovering artifacts in the hopes of uncovering the hidden crystals of Atlantis. 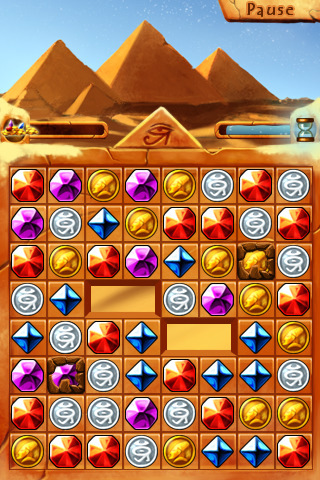 The artifacts are broken up into pieces in the match-3 grid, and you must get all pieces to the bottom before time runs out. This is effectively the same exact plot as Call of Atlantis, only without any mini-games between scenes and a slightly more stodgy interface. The plot, of course, is generally minor at best for match-3 games, but usually you want some cool bonuses on hand to keep the action from getting stale, but in the case of Crystals of Atlantis, fun bonuses are few and far between. You do get one rechargeable spell that you can use to destroy a single gem, but this is a far cry from the crazed explosions you might find in, say, Babo Crash or Bejeweled Blitz. Crystals of Atlantis is really just a plain Jane match-3, without any original charm to fall back on. If you’re just looking for an interesting match-3 game, then get Bejeweled or Babo Crash, because they’re much more dynamic and fun, but if you were drawn to the story and artwork of Crystals of Atlantis, then take your $0.99 and pick up Call of Atlantis instead. It’s essentially the same game, only much better. The Crystals of Atlantis is definitely a functional and even attractive game, but in such a densely packed genre, you need more than just the bare minimum to make it. AppSafari review of The Crystals of Atlantis Deluxe was written by Tracy Yonemoto on October 3rd, 2010 and categorized under Action, App Store, Games, Puzzler. Page viewed 4231 times, 2 so far today. Need help on using these apps? Please read the Help Page.